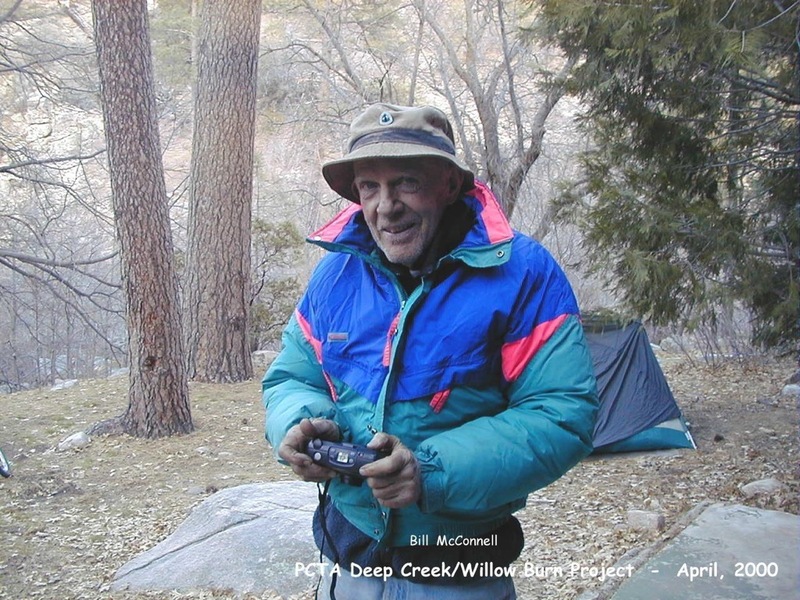 PCTA volunteer Bill McConnell passed away in early June at a retirement facility near his home in Big Bear, California. This was not a surprise. By my reckoning he was 97, or close to it. While it is sad that he is no longer with us, just thinking about him brings a smile to my face. A retired librarian, he was one of Alice Krueper’s PCT trail volunteers in the early 90s. At the time of his passing he was our senior Trail Gorilla, and until well into his 80s was a regular trail crew volunteer. A bit reserved, he was friendly and very good company. As you got to know him, small glimpses of his past would appear. Widely read, he became interested in celestial navigation, bought a sextant, and taught himself how to use it. Fortuitously, he was aboard a friend’s large yacht sailing down the west coast from Washington when the shipboard navigation system cratered. Bill got them to Los Angeles and on to their next destination, Hawaii, with his sextant. Diamond Head appeared right on schedule. His career and quiet demeanor gave no hint of his service as a paratrooper with the 101stAirborne Division during WWII. He was at Bastogne and became friendly with several Belgian residents. He returned after the war and as I understood, attended university there. He visited several more times and kept up the friendships made during the war. Every trail crew needs a cache master. At the end of each work day, this person selects a central place to leave equipment out of sight so that tools are not left strewn along the trail. The need for this became apparent early on when a sudden snow storm caused the crew to hastily evacuate. Their buried equipment was finally located after with what resembled an Easter Egg hunt. The appointee should be a senior person with a good memory who can find the cache the following day. By acclimation Bill was an inspired choice, but he modestly kept declining. I eventually explained that this was a hereditary position of great honor and responsibility, like being appointed Lord Mayor of London, which one does not decline. Plus, I told him, on formal occasions, he would get to wear a green jacket with a gold chain of office. He finally and reluctantly accepted and served with distinction, if not enthusiasm, for several years. I feel badly that the jacket and chain never materialized and can only hope he didn’t hold it against me. There was a humorous side to Bill. During a 10-day trail project where the rest of us camped at Mormon Rocks Fire Station, Bill and Jim Weinel decided to jointly rent a cabin in Wrightwood. Both were lifelong bachelors and Jim was another WWII paratrooper. To some of us, both seemed a little set in their ways, so it was no surprise as their stories unfolded during the project. Jim arrived first, selected the best of the two rooms in the cabin, and because it was noisy moved the fridge to the other room. It bothered Bill who moved it back at the first chance. Each morning, both would appear at Mormon Rocks Station and ride to the project with us in separate cars, each venting his frustration with the other about the fridge moving back and forth, the dickering over the bill and selection of food at the cabin. It was hilarious to the rest of us and we could hardly wait for the next installment. But with time their frosty relationship subsided and later they were companionable roommates at the PCTA Trail Fest in Sacramento. Jim is gone, and now Bill. Both will be missed for their dedication and good company they brought to the trail by those of us who were fortunate to know them. A PCT community blog feed.